35 x 23 7/8 in. Allan Stone Projects is pleased to present Steve McCallum: Paintings 1984-1998, on view February 21 – March 30, 2019. McCallum’s inventive approach to color, space and pattern are featured in six paintings selected from the Allan Stone Collection. 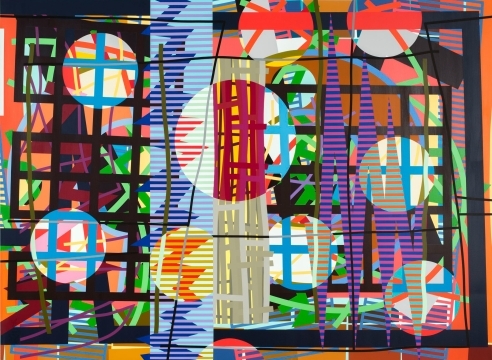 With their bright colors, energetic compositions and large scale, Steve McCallum’s paintings are steeped in the history of American abstraction. Amplifying the jazz energy of artists like Stuart Davis, McCallum cerates a maximalist style uniquely his own. McCallum employs color charts and masking tape to plan his compositions in a process similar to that of hard-edge painter Al Held, a longtime influence of the artist. Working from foreground to background, McCallum builds up each layer, revealing the final composition when the masking tape is removed. Depending on the layers and chromatic contrast, the implied space of each painting varies from deeply complex and dimensional to flat and geometric. Though his paintings are meticulously made, McCallum stops short of his work being entirely pre-planned, allowing for the freedom and kinetic energy that are so integral to his work. Steve McCallum was born in Alliance, Ohio in 1951 and received his MFA from Kent State University in 1976. He has exhibited across the US and in Sweden, including at the Akron Art Museum, the Cleveland Museum of Art, OH; the New York Institute of Technology, NY; Futura Gallery, and Stylt Gallery, Stockholm. McCallum has been honored with grants from the Gottlieb Foundation and the New York State Arts Council. His works are in numerous corporate collections as well as the Polk Museum of Art, FL; the Butler Institute of American Art, OH; and the San Diego Museum of Art, CA.